The Festival opened on September 18th with a hugely successful discussion between Lorna Bradbury (Deputy Literature Editor of the Daily Telegraph) and Malorie Blackman. She captivated her audience by telling them about Double Cross the fourth book in the Noughts and Crosses trilogy!! Carousel were delighted to sponsor a session in the Guildhall for families and young children. With an audience of about one hundred excited readers they learnt how Annette and Nick Butterworth created their wonderfully warm and reassuring stories about Jake, the well meaning dog who enjoys life but gets into lots of scrapes. Enthusiastic child artists joined in the game of Squiggles and left with their creations rolled up under their arm. The Ghanaian author and performance poet Nii Ayikwei Parkes has been announced as the second author to take on the role of Booktrust online writer in residence. As well as performing his unique brand of poetry on major stages across the globe, Nii Parkes is an established author of poetry and fiction for both children and adults – he has had his poem ‘Wrong Side’ memorised by pupils across the UK and his poem ‘Tin Roof’ was featured by the ‘Poems on the Underground’ initiative in June 2007. A socio-cultural commentator who has sat on broadcast panels with literary heavyweights such as Margaret Atwood and A.S. Byatt, he is the author of the novel Tail of the Blue Bird and the co-founder and Senior Editor of flipped eye publishing. Nii takes over from the Booktrust Teenage Prize winner Patrick Ness, who during his time in post wrote a much fêted exclusive addition to the award-winning The Knife of Never Letting Go. The writer in residence programme will run for two years, with a new author taking up the position every six months. Nii will take up his tenure from today, Monday 14 September 2009. During his time in the post, Nii will contribute one new poem to be published on the Booktrust website, a fortnightly blog, a video interview by schoolchildren, writing tips and advice on getting published, as well as hosting a special poetry event. to interact with readers, to share my experience, to explore the nuances of translation as people consume stories - for stories are only the starting point; the real tale lives in the contemplation the stories trigger, the dialogue they generate after the last page is closed." Nikesh Shukla, Booktrust Website Editor:"Nii Parkes is the Freddie Flintoff of publishing: a true all-rounder- he’s a performance poet, an author, a publisher, an editor and the hardest working man in the biz. He was an obvious choice to take over from Patrick Ness as our new writer in residence, and we’ve scored a century by getting him. Nii’s self-made career has given him a wealth of knowledge of the publishing industry and he will be a huge inspiration to aspiring writers. As someone who is immersed in technology and social networking media too, it’ll be great to collaborate with him on new and exciting multimedia online projects for Booktrust." on the Little Angel website http://www.littleangeltheatre.com/(click on What's On) and the Walker Books website http://www.walker.co.uk/ (click on What's On) Two actresses, fifty-five puppets, movement and song are combined in this production. 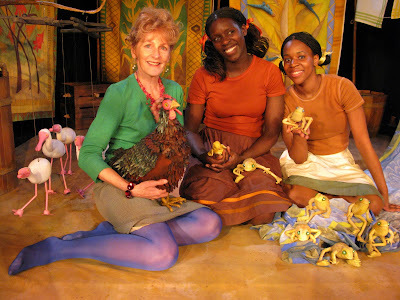 Come to Handa's Kenyan village where Mondi the hen has gone missing. Handa and her friend, Akeyo look everywhere. They find lizards, frogs, spoonbills and lots of other animals. But where is Mondi - and what's her secret? To celebrate the publication of Wishing for Tomorrow, Hodder Children’s Books are running a writing competition judged by Hilary McKay. Two lucky winners will receive a beautiful Victorian writing set and a signed copy of Wishing for Tomorrow. Four runners-up will receive a signed copy of the book. 1. In Wishing for Tomorrow. Ermengarde desperately misses her best friend, Sara Crewe. Alice, the maid, encourages her to write to her absent friend to tell her about life at the school. Imagine you are writing to Sara Crewe describing a typical day at your school. 2. In A Little Princess there is a poor hungry rat called Melchesidec who befriends Sara when she is banished to the attic. In Wishing for Tomorrow, Ermengarde looks after him when Sara has gone, and also makes friends with Bosco, next door’s pampered cat. Imagine you are an animal who befriends a schoolgirl. Write a diary entry about a typical day spent with her at her school. Remember that you are writing from the point of view of the animal! Bill Bailey, one of the judges, comments: It was great fun judging the prize, mainly because the standard of the books was so high...it's so hard to choose between them, and at one point it got so tense we got through a whole plate of chocolate brownies..it's tough this judging lark. All Join In: Participation and Inclusion in Literacy a one day conference at the Leeds Hilton 23 October 09 from 9.30 - 4.00 for teachers and librarians. Details on www.writeaway.org.uk/index.php Reduced fee booking until the end of September.